From cubicles to open layouts, rigidity to mobility, office designs have been completely turned upside down. And there’s good reason for such upheaval. Millennials are shaping the future of the office layout, and they’re providing a much-needed productivity boost along the way. Open floor plans replace segregating cubicles. Cafes replace rigid break rooms. Perimeter offices are all but gone. 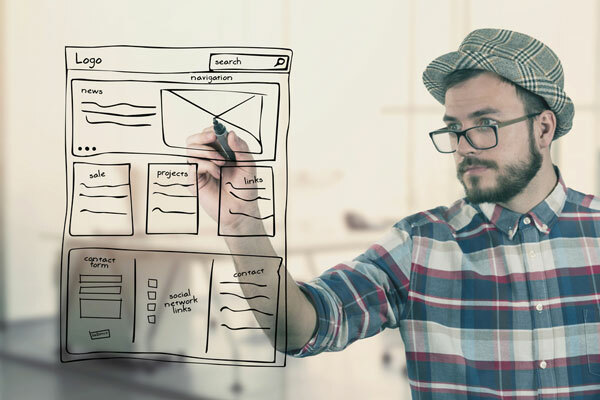 The way we work is changing with every emerging design trend. And we’re all getting more work done. The following productivity-boosting design trends will help you embrace this generation’s values of flexibility, mobility and community. These multipurpose spaces welcome employees to use breaks as they wish. An employee may use a free-form lounge to sit and chat with coworkers, enjoy a quiet break or collaborate in a relaxed environment. There is rarely an inappropriate time to use a freeform lounge area. 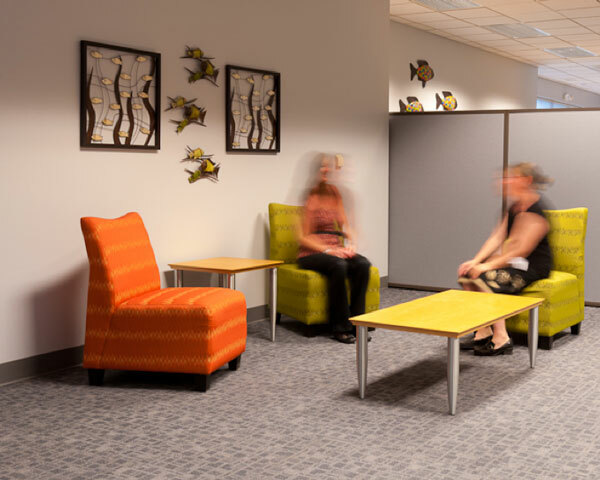 In contrast to a rigid break room, these inviting areas send the message that it’s okay to take breaks between work. In fact, it’s encouraged. Encouraging breaks may seem counterproductive, but it actually has proven the opposite. A good boss knows that more hours doesn’t always equate to better work. The Draugium Group recently put this methodology to the test. They installed a time tracking device on the computers of their most productive employees. The results were surprising. These employees weren’t working more hours. They were actually taking more breaks. On average, they took a 17-minute break for every 52 minutes worked. Color shapes how we see the world, and it helps us compartmentalize what we see. We’ve known for some time that color impacts productivity in the office. But we’ve recently learned how using color can help us retain and extract information. This theory has been tested and proven with graphs and tables. And more recently, office designs are being color coded to help employees compartmentalize tasks. Just don’t go choosing colors willy nilly. Certain colors are proven to boost happiness, productivity and creativity. Take a look at this infographic by Taskworld to see which colors are right for boosting productivity in your office. Imagine a pill that would help people concentrate better, process information faster and improve manual dexterity. This magic pill would increase reaction time by a whopping 12 percent. You’d put it on auto-subscribe for the entire office, wouldn’t you? Then what if I told you that you don’t need a pill for these results? You can accomplish all these things by adding plants to the office. Really. A Washington State University study on productivity found that people responded 12 percent faster on computer tasks when plants were in the room. Even without these stats, plants have always been a welcome addition to any office. They add life and color to a previously sterile room. 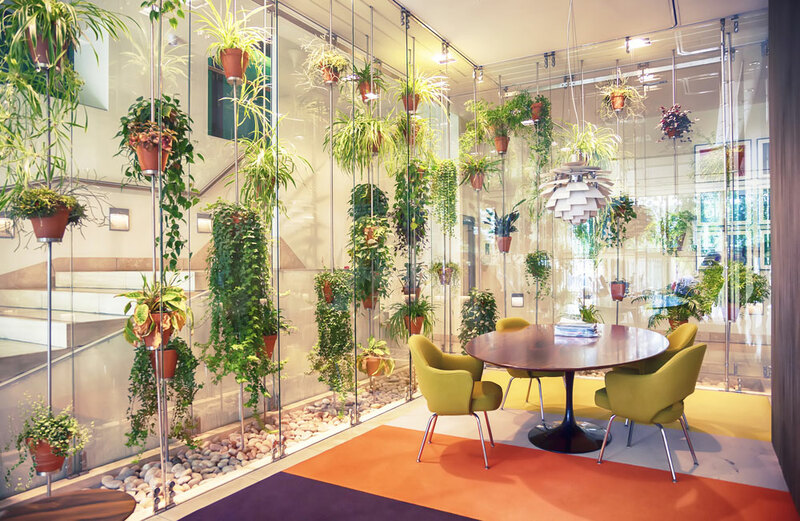 But current trends have made more room for plants in the office than ever before. With so many people working from remote locations –often outdoors– it has become more important to bring outside elements in to make people feel comfortable. Nature is having a serious moment in design. From natural light to reclaimed wood panels and exposed concrete flooring, design accents are mirroring the outdoors in unique and creative ways. But none can rival the benefits of adding natural light to your workspace. Humans intuitively strive to connect with nature. This phenomenon is called biophilia, and it’s also one of the hottest design trends of the moment. And fortunately, science backs intuition. Biophilic designs have also proven to help boost productivity. We’ve already discussed the benefits of adding plant life. Now we’re learning that natural light can also help keep the office alert. In a study published in the journal SLEEP, researchers reported that workers exposed to natural light slept an average of 46 minutes more each night. Workers without windows reported quality of life issues, including vitality problems and daytime dysfunction. Of course, not everyone can have direct access to a window. But there are some lighting tricks you can use to maintain some of the same benefits of natural light. Blue Lighting – Use a blue light in collaborative spaces and meeting rooms to improve performance. Another SLEEP study has shown that people perform cognitive tasks faster without sacrificing accuracy under blue light. 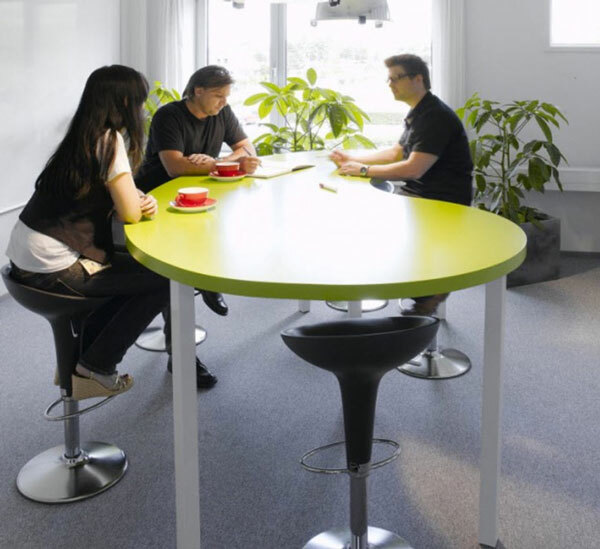 Dim Lighting – Dim the lights in creative workspaces to trigger a more creative workstyle. This works great for hands-on work, but be careful about dimming the lights when your employees are on their computers. The glare can do more harm than good. The community workspace has undergone an interesting transition since it first gained popularity. Many employers jumped into this trend with both feet and replaced personal workspaces with work benches and community tables. Unfortunately, those well-meaning employers were rewarded with a loss in productivity. As it turns out, most people do need their own personal space. Still, there are some benefits to collaboration. We just have to learn how to collaborate in the right way. Create a relaxed and comfortable space where coworkers can sit and brainstorm. But be sure they can return to their own workstations when it’s time for the real work to begin. A Harvard review suggests that pairing people of different educational backgrounds and personalities can help boost performance. Some people will try to tell you that clutter is the hallmark of a hard worker. Because when you’re putting in 110%, who has time to organize? Well, that philosophy simply reflects wishful thinking on those people’s parts. Office Depot surveyed 1,000 office workers. 82% said they are more productive when they are well organized. Clutter creates a confusing effect for everyone who sets eyes on the mess. When you are designing the office, be sure to create a space for everything your workers will need. This way, they can keep folders organized, papers filed and clutter in its place. 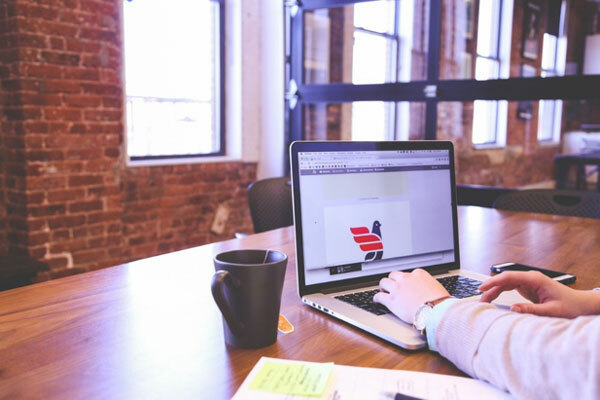 Seventy-two percent of global businesses reported that they’ve seen increased productivity as a direct result of flexible working practices. Such working practices include allowing employees to work from home or choose flexible working hours. But there is no reason to stop there. Flexible office layouts allow the workspace to change as the office needs or as employees’ desire. Flexible workspaces include modular components that can be mixed, stacked and moved around, offering countless combinations. Things like mobile walls can give the illusion of privacy when needed and they can be moved when the group feels the need for a more open plan. The days of working in a cubicle farm, like a cog in a machine, have fallen by the wayside. They may have seemed like a good idea when they made their appearance in the 1960s, but we’ve come a long way since then. Today, productive offices are knocking down the walls and opting for a more open floor plan. This allows natural light to grace the far reaches of the office, and it creates a more inviting space for everyone. Open workspaces foster productivity, learning and camaraderie, according to a Cornell University study. Ergonomic design is better for your health, but research has recently found that it’s also better for productivity. 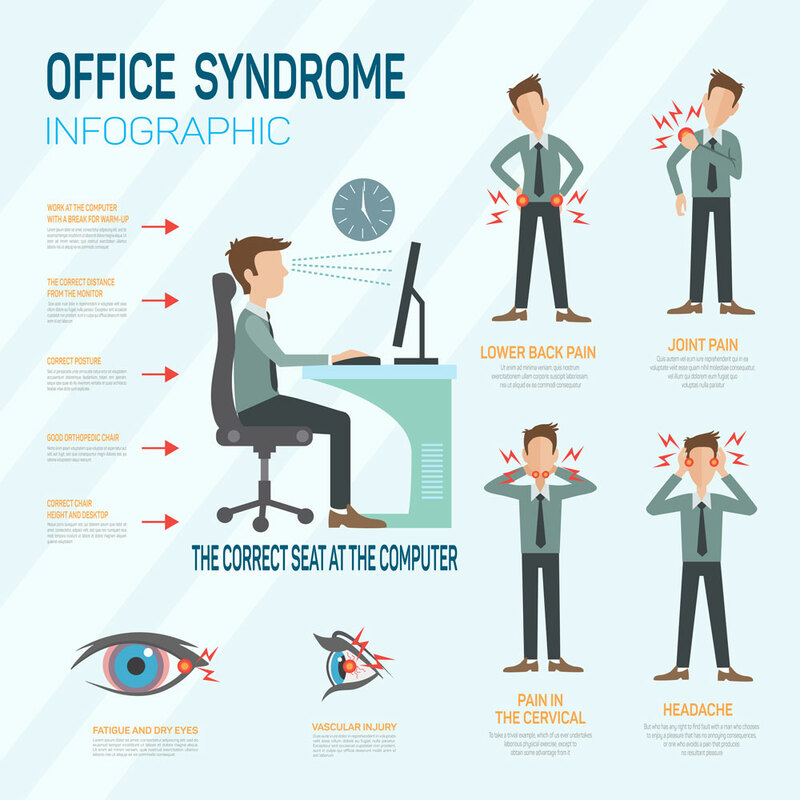 One study measured workers’ ability to collect monthly sales tax in dollars and found that those who had access to ergonomic design consistently recorded higher amounts, which equated to higher revenues for their company. Invest in ergonomic design for chairs and make adjustments to computer monitors and keyboards. Your employees will thank you and so will your bottom line. These days, more employees are working from home, and it has proven to be great for productivity. At home workers are happier, less likely to quit and more productive overall. Travel website Ctrip conducted an experiment where they allowed employees to work from home for nine months. They found that the same workers were able to handle 13.5% more calls. But the work-from-home model just isn’t right for every job or company. 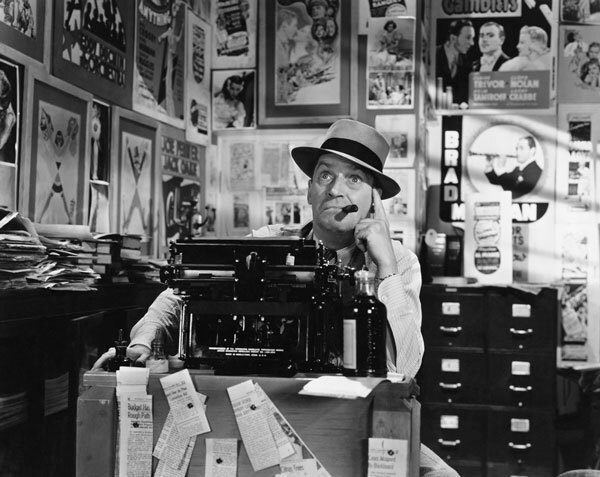 So how can you reap these benefits while keeping a more traditional office? Make people feel more at home in the office. A recent trend in office décor has offices looking more like home than ever before. Woods like oak and beech are replacing stark white laminate, and handmade and carefully-selected fabrics soften the room. 78% of people believe that being able to express creativity makes an actual difference in their lives. And only 25% of people believe they are living up to their potential to be creative. Allow your employees to create in ways that keep them interested, and you may be surprised with the result. Google is famous for doing this with their 20% project. They allow engineers to spend 20% of their work week on whatever projects interest them, and it has been great for innovation and morale. Give your employees all the tools they may need to be creative in their own ways. 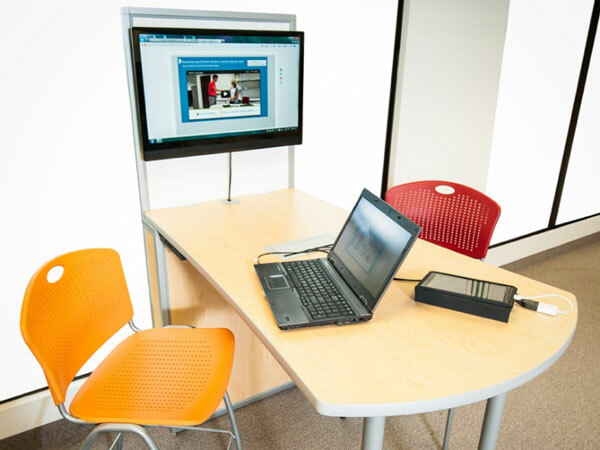 This may include mobile whiteboards, idea galleries or a dedicated space for creativity. With open floorplans and flexible workstations, the smart employer will create some sense of order. Although it may seem like a great idea to let employees run free, order will help ensure the productivity boost you’re after. 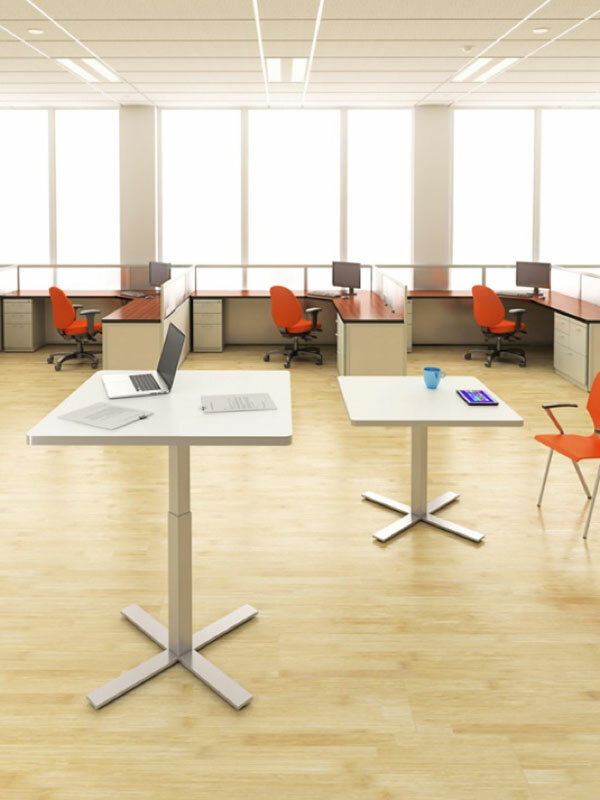 Create clusters of workstations for employees who work well together. A new study found that workers are more productive when they sit next to people who have complimentary work styles. In contrast, surrounding employees with the wrong people can bring productivity down. One study, published in the Lancet, showed that physical inactivity could cost the world $90 billion in healthcare and lost productivity. Consider this a large-scale look at what could happen in your own office. But just one hour of brisk walking each day could eliminate the risks associated with inactivity. While your staff is the office, be sure to encourage movement. This new design trend can help. Standing desks are becoming more commonplace and ball chairs are replacing traditional seats. Make tools like these available to your staff, so they can choose wellness over sedentary work. 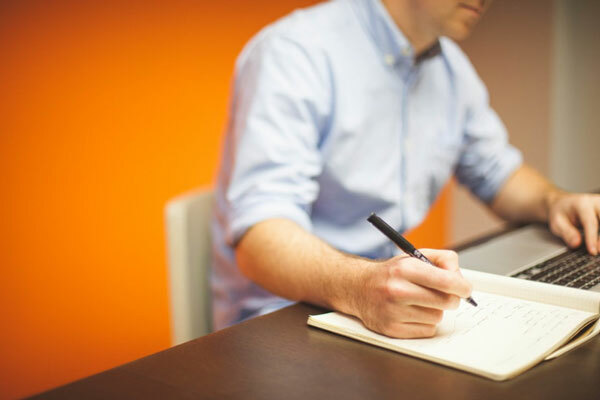 Follow one or all of these trends to boost productivity in your office. 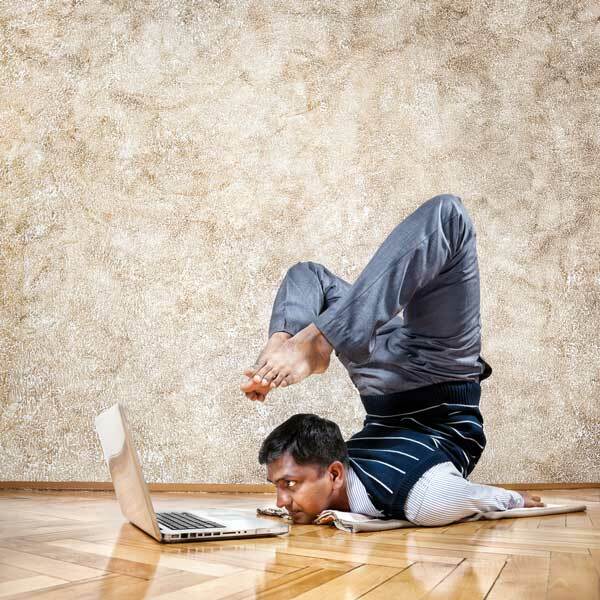 Not every solution will fit with your office dynamic, but flexibility is the beauty of these new trends. As you start choosing pieces, remember that quality is important. 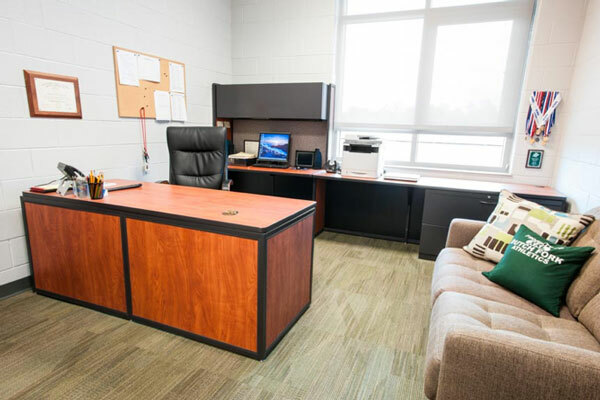 Invest in high-quality commercial office furniture that will stand the test of time, and your investment will pay off. Remember, you are investing in the future of your company. By 2025, millennials will likely make up 75% of the workforce. Time will only strengthen the goals of flexibility, mobility and community that this generation values so highly.